Microsoft's planning to relaunch its Live search engine under the name "Bing," a recent report suggests. Bing will debut with a massive ad campaign costing upward of $100 million, the folks at AdvertisingAge claim, putting both the "Live" brand and the "Kumo" codename into Microsoft's big brand graveyard. But what is "Bing," anyway? Its definitions vary from "a heap or pile" to "a blackish sweet cherry." Its Web site, though, has a slightly more colorful palette. Sure, bing.com is coming up mainly blank as of now -- but not too long ago, someone else had a thing for Bing. The bing.com domain name was first registered in late January 1996, just one year after yahoo.com and a year before google.com. (Microsoft snagged its own dot-com identity in 1991.) 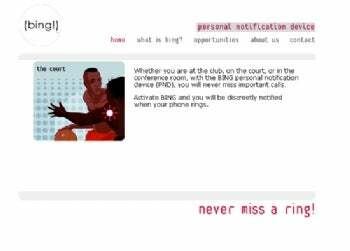 In its early incarnation, the name Bing belonged to a Colorado company trying to sell a "personal notification device" it described as "the first practical solution to personal and discrete cell phone ring notification." Hmm. Guess the introduction of the smaller cell phone with built-in vibrate mode kind of killed that idea. 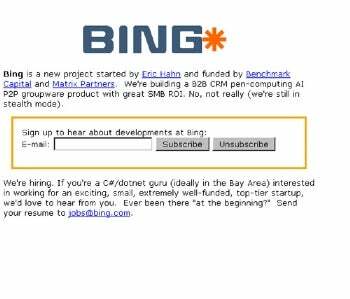 By 2006, the Bing notification device had buzzed out of existence and bing.com had gone back to being a parked domain. Toward the end of that year, though, someone else snatched up the domain and tried to put the "cha-ching" back into Bing. "Bing is a new project started by Eric Hahn and funded by Benchmark Capital and Matrix Partners," the revamped bing.com proclaimed. "We're building a B2B CRM pen-computing AI P2P groupware product with great SMB ROI. No, not really (we're still in stealth mode)." 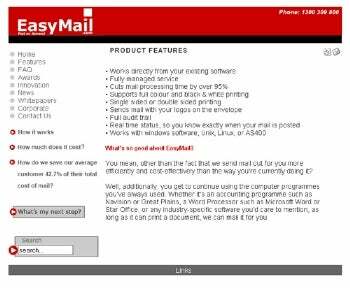 Within a couple of months, bing.com had morphed into a portal for a mail service known as "EasyMail." Billed as a "new era in postal mail," the next-generation bing.com allowed Aussies to electronically send documents into a "Bing post office," which would print and fold the papers, place them in an envelope, then send them out via the postal service. That site existed in some form at bing.com through at least the beginning of 2008. What appears to be the same company is still using the "Bing" name, though now operating at the domain bingmail.com.au. The bing.com domain records were last updated this past March and now indicate the site is owned by "Microsoft Corporation" at One Microsoft Way in Redmond. A tiny blue, orange, and white logo has appeared in the site's favicon -- that little square box that pops up next to the URL in your browser -- on and off during the day. It shows a lowercase "b" with a white-outlined orange circle inside.